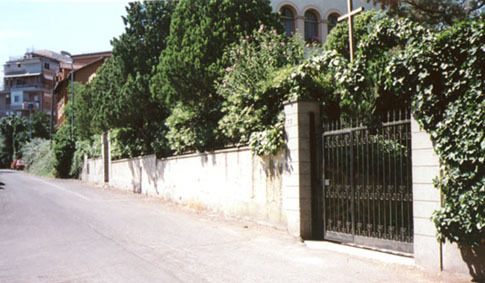 It corresponds to the entrance of the chapel "Mother of the Eucharist": it is a black gate with a cross on it. As soon as you enter the gate, the chapel is on your left: over the door you will see a small white statue of the Mother of the Eucharist. Please, pay much attention to the number (93), because "Via delle Benedettine" is a long and norrow street and there are also some very small convents on it. If the gate is closed, go back to # 91 and ring the doorbell. TAXI:It is the best of course; if you are in the center of Rome it will take at least 45 minutes (due to Rome's traffic). If the taxi driver doesn't know the street, show him the map. You have to arrive where the black arrow indicates. UNDERGROUND & BUS:Suppose you are at "Termini" central railway station. From there, take the underground "Linea A", towards "Battistini" station. Get off the underground at "Lepanto" station and then take the bus number 913 towards "Via Trionfale". Ask the bus driver to tell you when you are in "Piazza di Nostra Signora di Guadalupe" (it takes at least 30 minutes and consider that the bus driver usually speaks Italian only), then get off the bus after two stops. From there you have to walk for about 400 meters following the map. On the map is highlighted the final segment of the bus route by small black dots: they start from the middle right side of the map (you are in "Via Trionfale", next to "Forte Trionfale"). Anyway, from "Piazza di Nostra Signora di Guadalupe", take "Via F. Cherubini" (where you have to get off the bus), then take "Via M. Vegio" and finally you are in "Via delle Benedettine". You have to arrive where the black arrow indicates. You can find all these street names on the map. Pay attention: the bus doesn't arrive to "Via delle Benedettine", but it stops in "Via F. Cherubini", then you have to walk.